The Chinese lunar test mission Chang'e 5T1 has sent back some amazing and unique views of the Moon's far side, with the Earth joining in for a cameo in the image above. According to the crew at UnmannedSpaceflight.com the images were taken with the spacecraft's solar array monitoring camera. The mission launched on October 23 and is taking an eight-day roundtrip flight around the Moon and is now journeying back to Earth. The mission is a test run for Chang'e-5, China's fourth lunar probe that aims to gather samples from the Moon's surface, currently set for 2017. 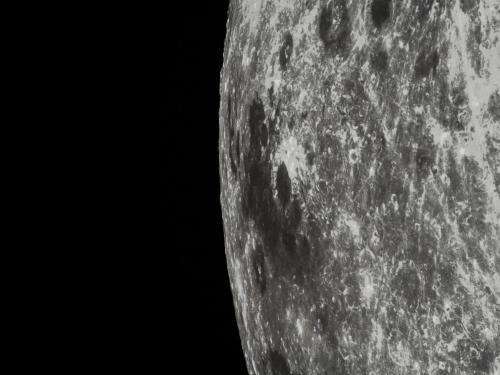 Chang'e 5T1 will return to Earth on October 31. Any moon colony should consider developing a water transport system for moving heat and energy from the day side to the night side, as direct thermal transmission can be more efficient than electricity. Maybe not water though, maybe have large air ducts which use nitrogen to move heat from the day side of the moon to the night side. Essentially, it should work via the thermo-siphon effect, and produce a natural wind/current from hot side to cold side, except unlike natural weather on an earth-like planet with an open atmosphere, this "wind" would be restricted to only moving in certain directions (the pipelines) so that it is never catastrophic and always supports the colony needs. I have given extensive thought to lunar and martian colonization, and you always want the most passive technology possible, with the minimum amount of electronics. Direct solar thermal turns out to be easier, safer, more efficient, and reliable. You can control wind via shutter exposures. Yeah, steam is probably most efficient, due to the high heat of vaporization of water, but I don't think there's enough water on the moon to use it as a mega-scale heat transport system, unless we're vastly under-estimating the amount of H20 incorporated into pores of lunar rocks or the chemical bonds of lunar rocks. The heat of vaporization of a cubic meter of liquid water at 1atm is enough to heat 2.1 cubic kilometers of air by 1C. So it seems to me that water transport and storage is easily the best way to regulate temperature within the living space(s) of a lunar colony. You can direct the thermosiphon effect by simply opening and closing valves, and there would be no need for a pump of any kind. I also showed you can use this energy for cooking and cleaning as well, via radiators, since the steam temperature would be well above boiling. the "eye" on a stove would just be a radiator with an insulator cover for when it isn't in use. I figured out you don't need advanced electronics. You just use concentrated solar boilers. The moon has plenty aluminum and silica for making mirrors and lenses, and they don't need to be 99% efficient. Since there is no atmosphere, they receive about 300w/m^2 more power from the Sun than a mirror at the Earth's equator would, so they can afford to be ~25 to 30% less efficient reflectors and still have the same total power output. So they can be made relatively low tech and still get the job done. Fewer electric circuits means fewer high tech, means fewer total components, means less statistical probability for failure. It is even conceivable to design a system which is almost totally passive and requires no heliostats or perhaps just one big one, because the lunar day is 28 days long. Oh yeah, on cooking surfaces, it's a closed system with perhaps two layers of heat exchangers. If something somehow explodes, the most it will effect is one room. Since there is neither an electric heating element, nor an open flame for cooking and cleaning, there is virtually zero risk of a fire at any time. Potentially ignition sources would be encased in a glass bulb with Helium over-pressure (vacuum is bad). If a spark somehow happens, it can't burn anything. If the bulb somehow breaks at the time of the spark, the excess pressure hopefully means that Helium keeps oxygen away from the spark long enough for smart grid to detect the flaw and cut power (a few microseconds probably) so that ignition doesn't occur. In fact, where possible, all internal light sources will derive their power from a system of passive or semi-passive light traps, which use little or no electronics (maybe even powered by photonics eventually) so no ignition is possible. Yes, I think of stuff like this. Unlike exploratory vessels, a colony living space must be absolutely fool proof in order to be successful over multi-generational time scales. Producing a light trap network would be possible, in principle, since there is silica on the moon. You just make fiber optics to transmit not only the data signals, but the actual energy (visible light) you want to use to illuminate a space. Light traps can be made on a larger scale too. I've seen DIY stuff done by "Green" people involving half-inch plastic transparent tubing and epoxy (pretty messy) but it can capture visible sunlight in the entire spectrum from a mirror or lens, and bring it inside with a power greater than a 100 watt bulb. If scientists keep working on ways to trap photons permanently in molecules or crystals, it may be possible to trap "Light" in a crystal for hours or days at a time, and stimulate it with a tiny voltage to release it...we can always hope. -Little or no electricity (God we are doing things so wrong on Earth). Surely the alternating day night cycle on the moon makes your idea as redundant as developing such a system for earth? It amazes me that Phys.org would publish such an obviously fake image. Why do I make that accusation? Check out the terminator lines on the Earth and Moon. The angles are wrong. 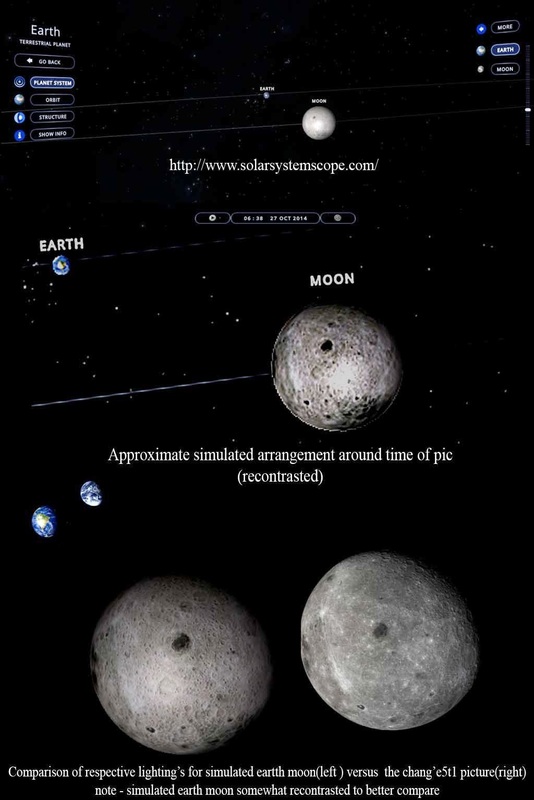 Not only that, there is more of the lunar surface visible, width-wise, than the Earth. Using the standard lunar phases as a guide, the Earth is closer to quarter while the Moon is closer to gibbous. Don't believe me? Use your own graphics package and enlarge the Earth. Put the two side by side. Check for yourself. Incredible means not believable. Why use hyperbole? 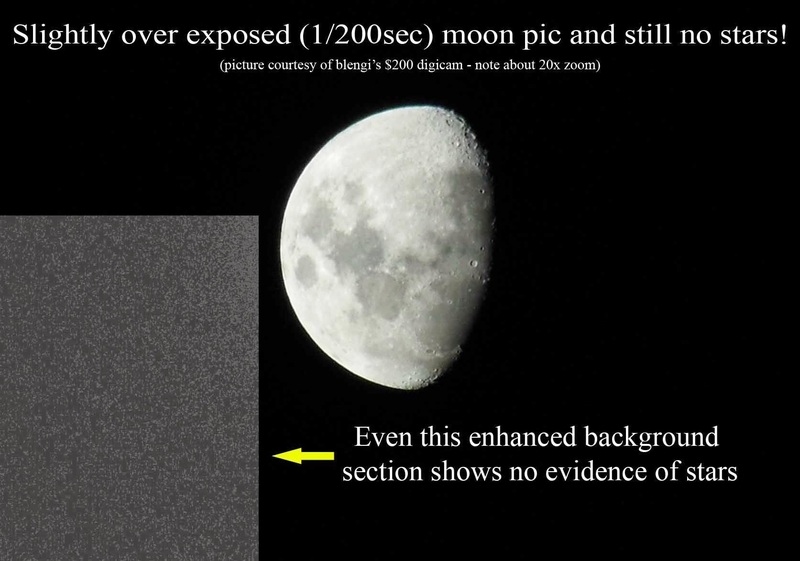 I too thought it a little bit weird on account of the differing phases between the earth and moon, and wondered - almost semi-conspiratorially lol - if it was somehow a "composed" shot. 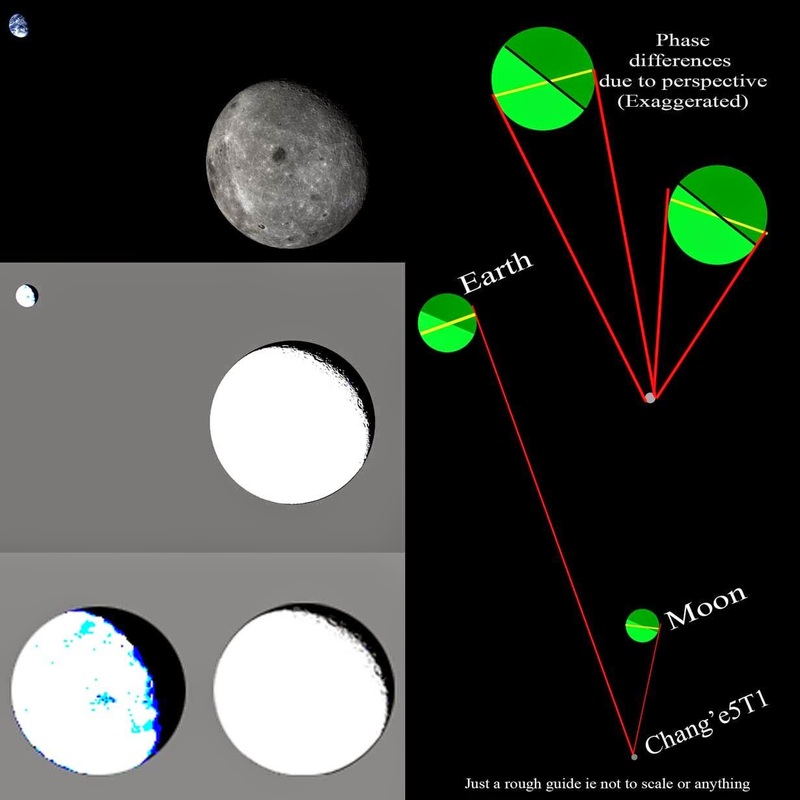 So like you suggested I used photoshop, and via a rough model noted that chang'e's perspective could adequately account for such an effect. Note: my picture/diagram is very rough ie earth should be 3ish times further away (on the red line extended outward) and the comparative earth moon sizing artistically skewed. Hopefully shouldn't overly affect the qualitative nature of what I'm try to expound. Climate? Blasphemy!!!! You have been possessed by the Evil IPCC! Quick run to your closest church and ask for an exorcism before they take your guns from you!! Using the standard lunar phases as a guide, the Earth is closer to quarter while the Moon is closer to gibbous. Very nice... as long as you see it from the Earth... but it happens that the image ins NOT taken from the earth. And why would they fake it? Makes no sense for something so unspectacular.
" You just use concentrated solar boilers." You will never see solar concentrators on the Moon, or in space, as there is no strong sunlight to concentrate. 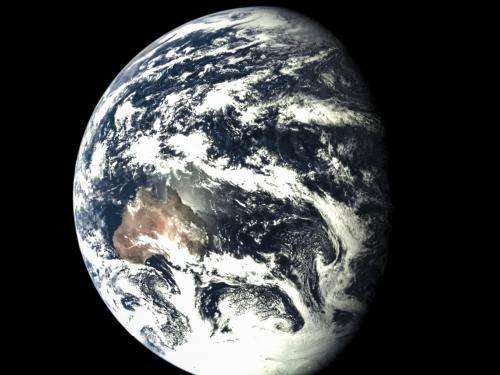 All light and heat on Earths surface is due to Earths atmosphere 'transforming' the Suns invisible EM radiation, and as the Moon has an extremely thin atmosphere, there is little conversion occurring. Why has NASA never even tried a demonstration of solar concentration in space? It doesn't work, that's why. And why is the Moon grey in that image? Images from Apollo and other missions have shown it should be a dull reddish-brown. 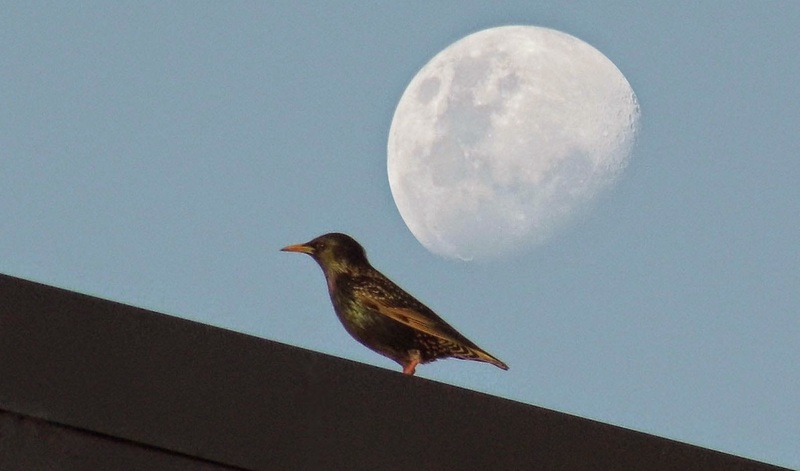 "And why is the Moon grey in that image? Images from Apollo and other missions have shown it should be a dull reddish-brown." Given this article said: "The test flight orbit had a perigee of 209 kilometers and reached an apogee of about 380,000 kilometers," and having googled typical parameters for free return trajectories prior, I was a bit worried at the 15,000km photoshop distance determination in my previous post. 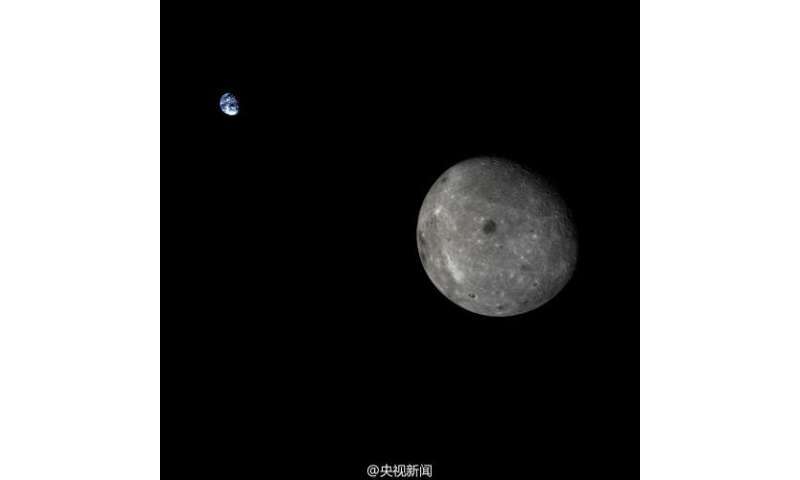 "the Chang'e 5 Test Vehicle entered an orbit with an apogee of a little over 400,000 Kilometers. " & "closest approach up to a distance of 12,000 Kilometers". I appreciate your intelligent response to my observation. Unfortunately, you fail to take into account the fact that the angles of light along the terminator should be the same between both bodies. They cannot be different. As a test, use your favorite graphics program and enlarge the earth and place it over the Moon. There is a marked difference that cannot be explained. Don't take my word for it. Have an expert in graphics software examine this image. It's clearly fake. You should check it out it's pretty cool, & shows how perspective can readily affect such things. You are correct. Very cool website. You have made some compelling arguments with respect to the lighting. At this time, I will yield to your evidence in this regard. There are, however, two other areas in which I will not yield. First, the lack of a star field. I, too, have taken properly exposed pictures of the Moon and I have also captured the very faint glow of Mars. There should also be similar faint stars in such a wide field of view. There are none. 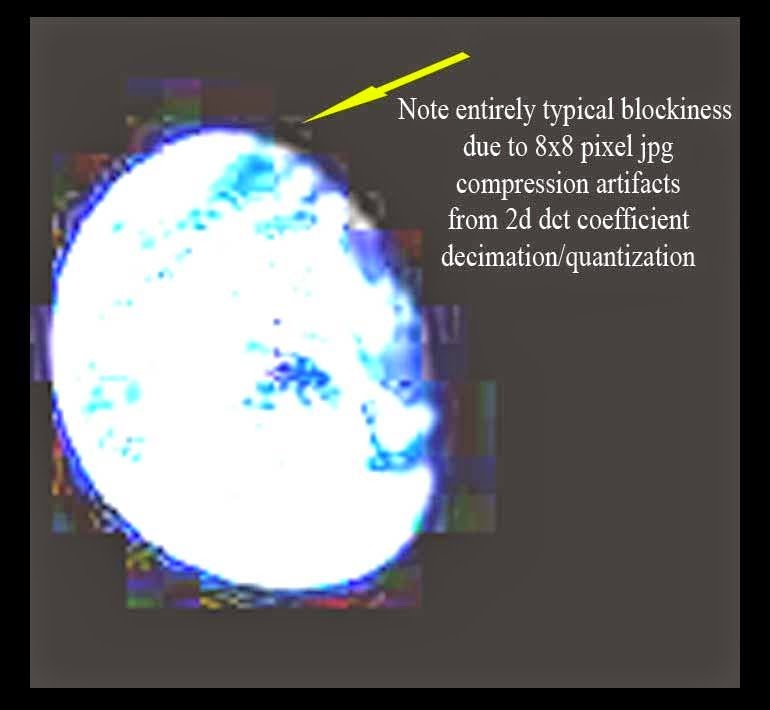 Second, the block pixelization should be gradual and uniform around the earth. It is not. The blocky pattern is too big and abrupt in spots and not consistent around the planet - a sure sign of a cut and paste. Saying there should be stars in the image is the old line of the nutters who said that Apollo didn't go to the Moon. There is no reason to expect to see stars in an image with two brightly lit objects. As for the alleged blocky fringe, I boosted the gamma as far as it goes and didn't see any. If they really are there, jpeg artefacts round a high contrast objects is a much better explanation than fantasies about faking.